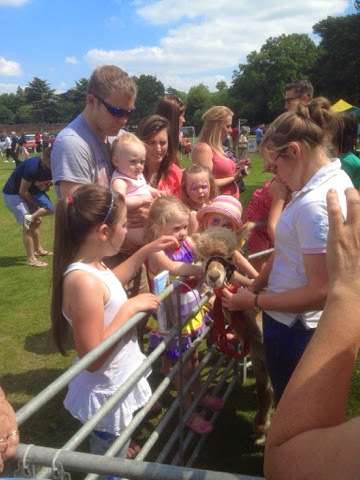 If you can actually be feted then our alpacas were definitely that at the local village fete yesterday. England was out in all it's glory in Dunchurch and the whole village and half of Rugby must have rocked through the local sports field. 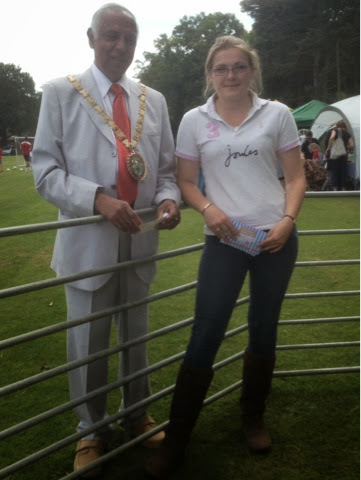 The Rugby Mayor was even trotting around in his finery glad handing all and sundry. Our new assistant herdswoman, Freya Shuttleworth, was on 'touch and stroke' duty in the alpaca pen entertaining the crowd with lots of alpaca chat. This was a first for Freya and she did a great job. Once she realised the folks weren't going to eat her she really enjoyed it! And me? Well I had a lovely day catching up with old friends and acquaintances. It also provided us with a great opportunity to promote the new Cornflower pop up cafe at Toft which we all did in spades. 'Coffee and cake to die for Governor! Here have an ice cream voucher...' We gave it large for the Cornflower cafe. My wonderful mother in law Myra was, as always, a stalwart at making sure no one left without a leaflet. At 82 she's worth three half her age, bless! The Dunchurch village fete is a real traditional English affair and a credit to the organisers. On a wonderful summers day like yesterday it was a joy to take part in. There can't be a child within a ten mile radius of Toft who by now does not know what an alpaca is. I look forward to seeing them all again throughout July when they turn up for their ice cream. Early in the morning the sound of orgling males reverberates from the hard standings around Toft as the mating schedules get under way. Stud Males on head collars are walked around to the appropriate eager females waiting for business to be concluded.These young elite prizewinning females are showing a great interest but they will have to wait. At Toft we never mate the females until they are fully mature at two years old. 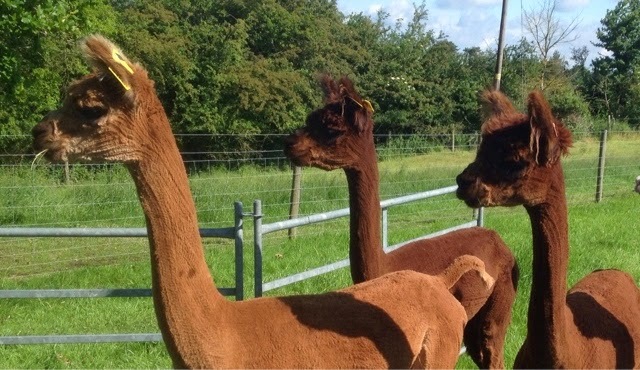 However these elite female stars of the Toft Alpaca Showteam are fully mature well up for it. They sit like dinner plates on the first note from the male. Haven't the heart to tell them that's as good as it gets for the next 12 months! 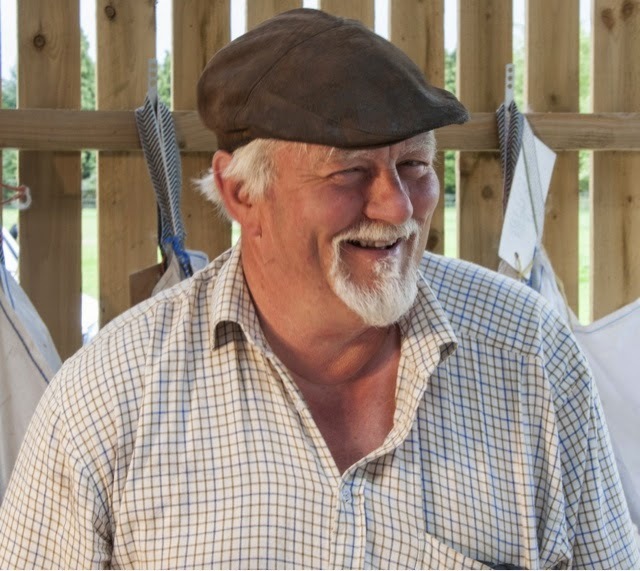 Someone sneaked a picture of this strange man in our shearing shed in his 'greengrass' costume wearing his Fred Dibner. Those Papparizzi just don't care! What do you do with the old girls? Eat them? At Toft we give them a beautiful new paddock just to themselves in which they can reminisce about days of yore. We have just commissioned this field as part of our 15 acre extension. We don't think it has had livestock in these fields for at least ten years that we can recall. It's been a big old job since December getting them ready for the alpacas. Now it looks beautiful and the alpacas took up residence this week. It should be called the rest room as it accommodates those alpacas having a year out, the old girls who are retired and ready to live out their years as companion animals, the odd alpaca that never gets pregnant and some clients younger girls looking for a new home who will be sold mated to order. A real mix of age and ambition and no doubt plenty of cross generational gossip to keep them all amused! 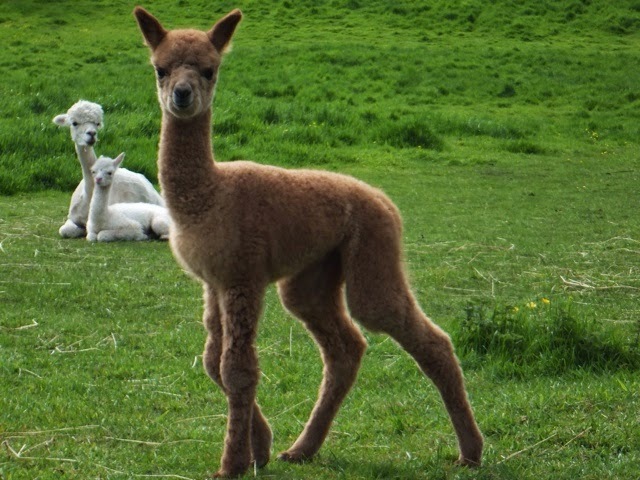 There's a lot of big boned stunningly conformed cria on the ground in our neck of the woods showing some excellence at a very early stage...it has to be something to do with the mild winter. 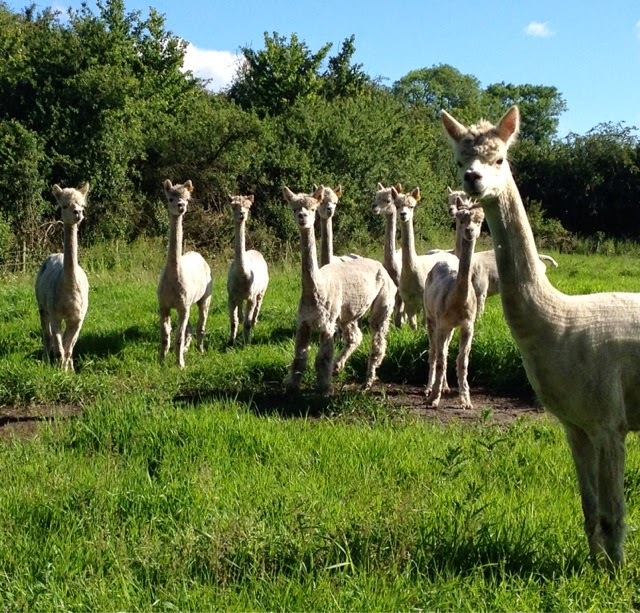 We've more grass than you can shake a stick at and all the cria seem to be landing early having grown to their full genetic potential this season. Bodes well with thirty or so still to drop. Watch this space! We certainly get about a bit us 'Toftees'. Shirley and I had a bit of a 'stop out' on Saturday night when we went up to Cheshire to celebrate Naimh and Vivienne's wedding. 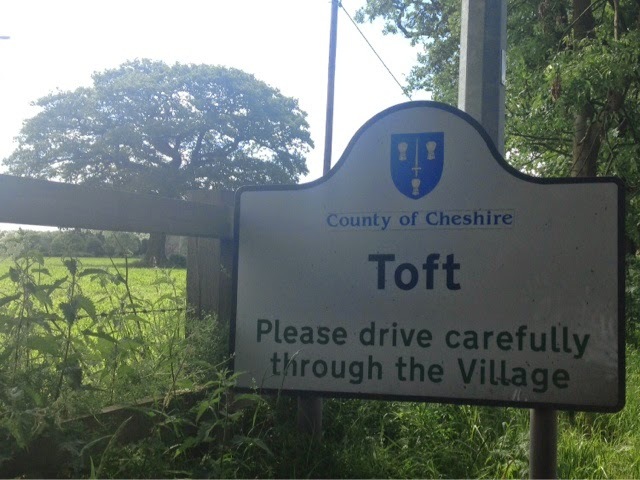 We stayed in a lovely hostelry called The Dog and situated between us and the do was a village called Toft. Although it didn't seem f a lot bigger than our wee hamlet in Warwickshire it was certainly a lot better signposted. Thankyou Cheshire for making us feel at home. 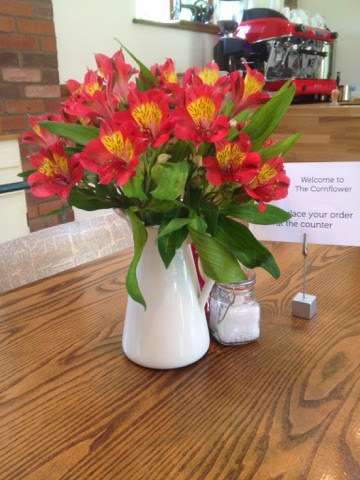 Looking forward to Lunch at the Cornflower Cafe.. Even the table decorations look good enough to eat ! Open Thursday through Saturday 9am-4pm . Getting busier by the day and rapidly becoming Warwickshire's hidden secret! Cake coffee and sarnies to die for! 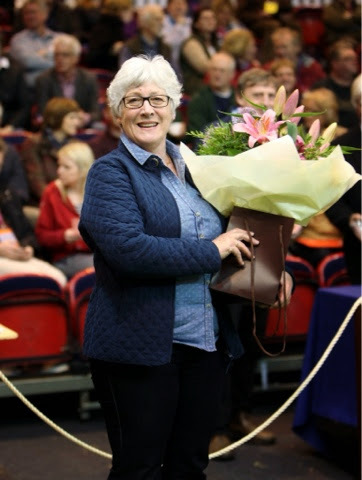 Here's Shirley at the BAS AGM picking up a prezzy for being my supporting partner during the years I was on the board of the BAS. As you can see my Companion Animal is not slack at getting in the limelight. Great Pick arrived yesterday thanks to the BAS. It's one for the archive.